Browse the list below for all Wrox Blox titles on general IT / programming subjects. Here's where you will find the most up-to-date technical expertise on a wide variety of topics, including Adobe, AIR, Flex 3, OOP, desktop programming, ActionScript 3.0, SDK, Mobile Safari, iPhone and iPod Touch programming, BizTalk, ESB, SOA, Service Orientation, and more. 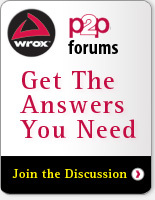 You can count on Wrox Blox to help build your programming knowledge, today!